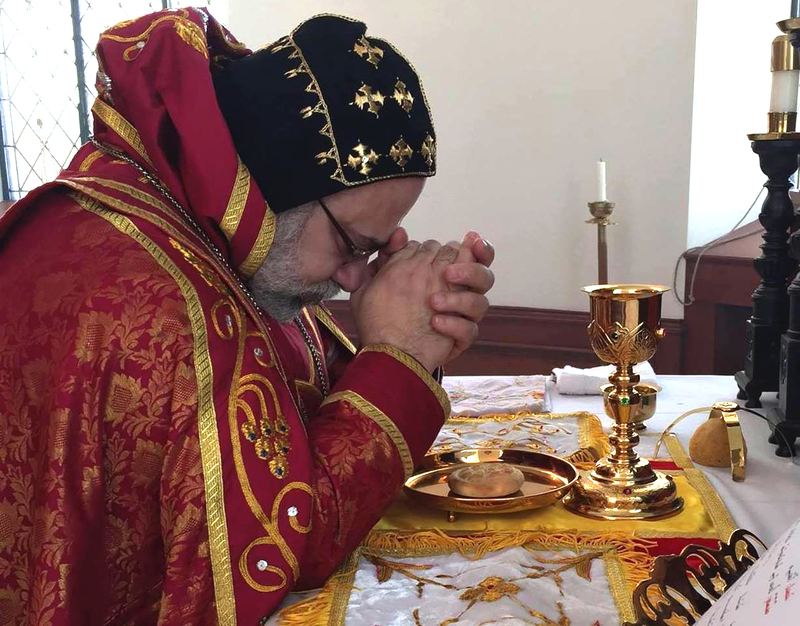 We extend our apostolic benediction, best wishes and greetings to our brothers, their eminence, the metropolitans; to our spiritual children: The honorable vicars, priests, monks, nuns, deacons and deaconesses; and to all our esteemed Syrian Orthodox faithful. May the divine providence protect you through the intercession of the Virgin Mary, Mother of God, chief of the apostles saint Peter and all the saints and martyrs. Amen. “Simon Peter answered and said, You are the Christ, the Son of the living God.” (Matthew 16:16). Mahatma Ghandi, the famous Indian thinker, told some western preachers: ” I want your Christ, not your Christianity. ” Once, he was asked to speak to a multi ethnic and religious group and he responded by opening the Holy Gospel and proceeding to read the Sermon (of the Lord Jesus) on the Mount, He also declared that he read it always. Mahatma Ghandi and other such non-Christian leaders of nations, great thinkers, philosophers and scientists throughout the ages, knew the Lord Jesus through His divine and moral teachings and through His pure and holy reputation. They perceived Him only as a great prophet and an outstanding social reformer. Howbeit, by such assumptions, some ancient and contemporary pretenders changed the Gospel of salvation into a social gospel. By so doing, they fell into heresy and strayed from the true path. They pretended to be Christians in order to spread their awful teachings. However, their Christianity is false and Jesus Has distanced Himself from them of whom He had said: ” Many will say to Me in that day (Judgment Day), Lord, Lord, have we not prophesied in Your name, cast out demons in Your name, and done many wonders in Your name? And then I will declare to them, I never knew you; depart from Me, you who practice lawlessness! ” (Matthew 7:22-23). The Lord Jesus also warns us against deceivers and those who have gone astray, saying: ” Beware of false prophets, who come to you in sheep’s clothing, but inwardly they are ravenous wolves. You will know them by their fruits ” (Matthew 7:15-16). Likewise, concerning this, St. Paul writes to the faithful in Galatia, saying: ” But there are some who trouble you and want to pervert the gospel of Christ. But even if we, or an angel from heaven, preach any other gospel to you than what we have preached to you, let him be accursed. As we have said before, so now I say again, if anyone preaches any other gospel to you than what you have received, let him be accursed ” (Galatians 1:7-9). Yea, the Lord Jesus elevated humanity to high standards by blessing the poor in spirit, the pure in hearts, the humble and their pious likes. He also hated sin and condemned it, but loved the sinner and called him to repentance. However, Not only did He condemn the sin of adultery, for example, but also denounced the evil and lustful eye, which is both the root of this sin and its origin, by saying: ” You have heard that it was said to those of old, you shall not commit adultery. But I say to you that whoever looks at a woman to lust for her has already committed adultery with her in his heart. If your right eye causes you to sin, pluck it out and cast it from you; for it is more profitable for you that one of your members perish, than for your whole body to be cast into hell ” (Matthew 5:27-29). The Lord Jesus laid down the golden rule on how should one deal with his brother, saying: ” Therefore, whatever you want men to do to you, do also to them, for this is the Law and the Prophets ” (Matthew 7:12). Obviously, the Lord Jesus lived on earth according to His own divine teachings in a manner that this world had never seen. It shall never again witness such a historical person or even a legendary being who would possess the wonderful traits and noble characteristics of the Lord Jesus Christ. Yes, He also, made of Himself a true example for humanity through His pure walk and noble character, by which He affirmed the possibility of applying His divine commandments and heavenly teachings, which, when heeded, leads man to evangelical perfection. Because the law of the Lord Jesus is not a fantastic law which one cannot observe! And it is not such a heavy burden which none might bear! On the contrary, the Lord’s burden is easy and His load is light. The Lord Jesus invites us to imitate Him, saying: ” Come to Me, all you who labor and are heavy laden and I will give you rest. Take My yoke upon you and learn from Me, for I am gentle and lowly in heart, and you will find rest for your souls. For My yoke is easy and My burden is light ” (Matthew 11:28-30). Indeed, it would be very dangerous, and alien to the spirit of the Holy Gospel, to assume that the Lord Jesus is equivalent to Moses, Elijah and the rest of the prophets. Because He is not simply a just man and a great prophet! On the contrary, He is infallible to the point that He challenged His enemies by declaring to them and His followers: ” Which of you convicts Me of sin ” (John 8:46)? This infallibility of Christ gives a clear proof that He is superior to man. On one occasion, He said: ” No one is good but One, that is, God ” (Matthew 19:17). Here, the Apostle Paul clarifies the truth about the Lord’s divinity, by saying: ” And without controversy, great is the mystery of godliness: God was: manifested in the flesh, justified in the Spirit, seen by angels, proclaimed among Gentiles, believed in by the world, received up in glory ” (1 Timothy 3:16), and this verse by St. Paul is a summary of faith in the divine incarnation. Moreover, the Apostle John explains the ultimate purpose for writing the Holy Gospel by saying: ” But these are written that you may believe that Jesus is the Christ, the Son of God, and that believing you may have life in His Name ” (John 20:31). Even the Lord Jesus did clearly direct the eyes of His followers to reflect on His divine person. For He is God’s Only-begotten Son Who came from heaven for the salvation of humanity, saying: ” For God so loved the world that He gave His Only-begotten Son, that whoever believes in Him should not perish but have everlasting life ” (John 3:16). The Lord even let the world know that He is ” The Light of the World ” (John 8:12; 9:5), ” The Way, The Truth, and The Life ” (John 14:6), ” The Resurrection and the Life ” (John 11:25) and also that: ” He who believes in Me, though he may die, he shall live ” (John 11:25). True faith in our Lord Jesus Christ was indeed summarized by the First Ecumenical Synod of Nicaea (325 AD) in the Creed of Faith which it authored. It came from the summarized canons of faith originally set by the Holy Apostles and their disciples, the Holy Fathers. This Creed was recited by all who come forward to receive the sacrament of Holy Baptism, at the beginning of the service of this sacrament. This same Nicaean Creed is recited by the faithful every evening and morning, and every occasion in which they prayed to God. By so doing, they confess their faith in the Lord Jesus Christ Who Was begotten of the Father before all the worlds. For He is the Only-begotten Son of God and Was incarnate of the Holy Spirit and of the Virgin Mary and saved the world by His suffering, death, resurrection and His ascension into heaven and He will come again, on the Last Day, to judge both the living and the dead, and His kingdom shall have no end. Indeed, preaching about the good life of the Lord Jesus, and His moral and noble parables, without declaring the true belief in His divinity and His Eternal Sonship to the heavenly Father, diminishes His due honor and is an estrangement from the fountains of His divine teachings and heavenly commandments. It becomes rather a rejection of Him Who says: ” Also I say to you, whoever confesses Me before men, him the Son of Man also will confess before the angels of God. But he who denies Me before men will be denied before the angels of God ” (Luke 12:8-9). Therefore, as we question our conscience, heart and mind, we must ask ourselves a very important question whose answer will determine our eternal destiny. Do we truly believe in the Only-begotten Son of God, the Lord Jesus Christ, and accept Him also as our own Savior and of the world? Though the Apostle Thomas once doubted the resurrection of the Lord Jesus from the dead, yet he remained among the company of his brothers, the disciples, so the Lord Jesus pitied him and appeared to him on the eighth day after His resurrection. He tenderly talked to him and gently rebuked him, prompting Thomas to worship Him ” And Thomas answered and said to Him, My Lord and my God ! Jesus said to him, Thomas, because you have seen Me, you have believed. Blessed are those who have not seen and yet have believed ” (John 20:28-29). Beloved, we do not behold the Lord Jesus through our mere eyes, but rather we see Him through the eyes of faith, and we believe that He is the Only-begotten Son of God and the Savior of the world! as He taught us by His Holy Gospel, and as we had received from the Holy Apostles and just Fathers. May we then beseech Him to increase our faith and strengthen us to combine faith with good deeds. The Apostle James says: ” Thus also faith by itself, if it does not have works, is dead. But someone will say, You have faith, and I have works. Show me your faith without your works, and I will show you my faith by my works. You believe that there is one God. You do well. Even the demons believe — and tremble! But do you want to know, O foolish man, that faith without works is dead ” (James 2:17-20)! Didn’t the demons confess Him, saying: ” What have we to do with You, Jesus, You Son of God? Have You come here to torment us before the time ” (Matthew 8:29) i.e., before the Day of Judgment? However, He used to rebuke and order them to leave people. Thus my beloved, in the advent of Holy Lent, let us seize this occasion to renew our covenant with the Lord Jesus, the Only-begotten Son of God, carry His Holy Cross and follow Him, as did our fathers who begat us in the flesh, as well as those who spiritually begat us. For they all were just, heeding the Lord’s commandments and upholding His laws through fasting, prayers and the giving of alms. May we also distance ourselves from the deceived and the deceivers, and from modern deceivers who stray from the true path and renew the ancient cults and heresies which the Holy Church has condemned since its inception throughout ageless time. Let us also plead with God to increase our faith by sending unto us His Holy Spirit which was spoken of by the Lord Jesus: ” But the Comforter, the Holy Spirit, Whom the Father will send in My Name, He will teach you all things, and bring to your remembrance all things that I said to you ” (John 14:26). Moreover, the apostle Paul says: ” Therefore I make known to you that no one speaking by the Spirit of God calls Jesus accursed, and no one can say that Jesus is Lord except by the Holy Spirit ” (1 Corinthians 12:3). Finally, we should combine our true faith in our Lord Jesus Christ with a holy way of life so that our Christianity may be true and pure, not a false one, approved by our Christ Who commanded us to: ” Let your light so shine before men, that they may see your good works and glorify your Father in heaven (Matthew 5:16). May God accept your fast, your prayers and offerings and bless you with good health, honorable success and long life. May He also prepare you to joyfully and happily celebrate the feast of His resurrection from the dead, and may He be merciful to your faithful departed ones. May the grace of God be with you. Amen. Our Father Who art in heaven etc. The 18th year of our Patriarchal Reign.